Having covered Manufacturing (link here) and Services PMIs (link here) for BRIC countries, consider Composite PMIs next. Note, to make series consistent with my previous indicator, I use x2 factor on composite PMI readings from Markit, going forward, so reference number here is not 50.0 but 100.0. Brazil Composite PMI firmed up marginally to 89.6 in August from 86.3 in July. This is the fifth highest reading in recent months, but sixth consecutive reading below 100. Per Markit: "Rising to a five-month high… the Brazil Composite Output Index pointed to a further, although weaker, decline in private sector output. Whereas manufacturing production decreased at a quicker rate, the reduction in service sector activity softened. … New business in the Brazilian service sector decreased for the sixth straight month in August. …Order book volumes at manufacturers dipped at the fastest pace in four years. Subsequently, the contraction in total private sector new work accelerated to the sharpest in three months." 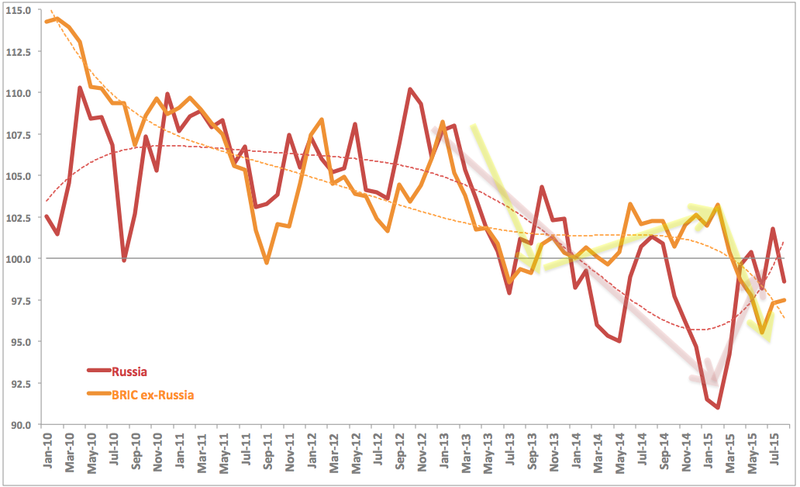 Russian Composite PMI was also soft, falling to 98.6 in August compared to 101.8 in July, returning the economy toward renewed recessionary momentum after fragile improvement in the first month of 3Q 2015. 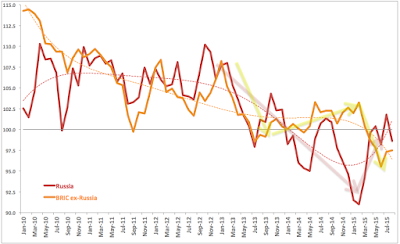 More on Russian Composite PMI here: http://trueeconomics.blogspot.ie/2015/09/3915-russian-manufacturing-services.html. China Composite PMI too posted sub-100 reading, falling to 97.6 in August compared to 101.6 in July. Per Markit release: "Though only modest, it was the fastest contraction of output seen since February 2009. The renewed decline in overall output was largely driven by a faster contraction of manufacturing production in August. Furthermore, the latest fall in manufacturing output was the quickest seen in 45 months. Meanwhile, slower growth in service sector business activity also weighed on the headline index. Consequently, total new business at the composite level fell for the first time since April 2014, albeit marginally. ...the latest expansion in service providers’ staff numbers was the weakest seen in the current two-year sequence of job creation and fractional. Job shedding persisted at manufacturing companies, with the pace of reduction quickening slightly since July. Overall, composite employment fell for the third month in a row and at a modest pace." India Composite PMI firmed up to 105.2 from 104.0 in July, marking improved growth outlook for the economy and breaking, once again, trend with the rest of the BRICs. Per Markit: "India’s private sector economy improved further in August. The seasonally adjusted Nikkei India Composite PMI Output Index rose to a five-month high… The uptick in growth was boosted by a quicker expansion of services activity, as the increase in manufacturing production softened in August. …New business across the private sector as a whole expanded at a moderate pace that was the quickest since March." 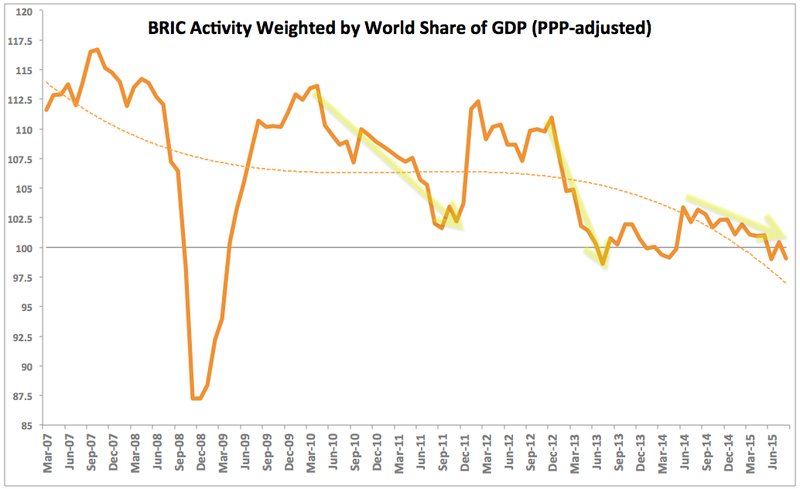 SUMMARY: As charts above show, BRICs as a block are now exerting negative drag on the global economy. This is extremely worrying especially as the core drivers for this weakness are now China and Brazil, opposed to Russia. 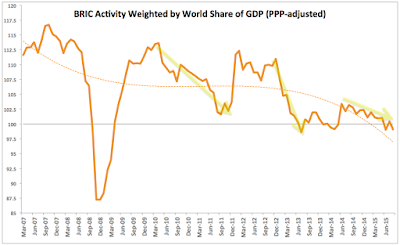 While Russian economy remains in a recession, overall, it is responsible for lesser share of negative momentum in the BRICs index than the other two troubled economies since around the start of 2Q 2015.